MMO-Champion reports that as of today, the in-game shop now has a Toys category and three new items to purchase, after it was briefly put up and yanked down earlier this morning. This is interesting for a variety of reasons. It’s the first time we’ve seen toys on the store — previously all toys have been in-game drops or quest rewards — and it’s a completely new category for the store itself which of course means we could see more expansion of the ability to spend real money for in game rewards. The transmog helms from a few years back are no longer available, but the addition of toys to the store means that we could well see transmog items like those again, or something entirely new. 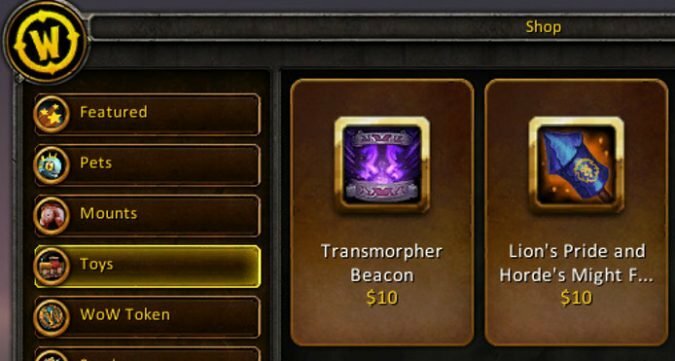 The Transmorpher Beacon is less obviously related to toys for sale to raise money for PVP and PVE esports winning pools than the Horde and Alliance faction fireworks, but I guess it would be cool to look like some of WoW’s most fearsome bosses when you’re engaging in trying to clear high difficulty Mythic dungeons. Coming at your opponents while looking like Blackhand might even give you a bit of an edge in the Arena, but I wouldn’t count on it. The Beacon and the bundle of both fireworks are $10, which should give those WoW esports prize pools quite the leg up. So, how do you feel about Blizzard expanding its in-game shop? Would you rather these toys be available in some other manner, or are you okay with the occasional purchase for fun stuff?